This recipe was inspired by a picture of pink pasta I saw on the internet. Here I use beetroot juice to colour the courgette which isn't purely asthetic, it sweetens and gives a nice subtle flavour. This recipe will make a huge plate full so is great to serve and enjoy between 2 people, healthy comfort food! What you'll need to do ahead of time: Marinade & wilt the broccoli - read the recipe to find out how to do this. 1 pack of tenderstem broccoli - about 10 to 15 stalks. If you can't find tenderstem broccoli you can use a more common broccoli with shorter stalks and arrange them slightly differently on the plate. Take any leaves off the broccoli and place them in a large bowl. Add the remaining ingredients and leave to marinade for 2 hours or more. You can also place the bowl, covered, in a dehydrator on 115 degrees F so speed up the wilting process. This also has the advantage of your broccoli being warm when you eat it. Juice the beetroot and transfer to a large bowl. If you don't have a juicer capable of doing this then grate the beetroot instead of using juice. Cut the tips off each end of the courgette but leave the skin on. Slice the courgette in a mandolin and then stack the slices up so you can cut them all together to make linguine type strips. Once cut into linguine strips, transfer to the bowl with the beetroot juice and add the rest of the ingredients. Set aside whilst making the rest of the recipe. The longer you leave the courgette to marinade, the more purple it will be. In the photo example I left it in overnight. Pulse all ingredients in a food processor, leaving the mixture slightly chunky. In a different bowl mix the walnut pesto in with the purple pasta by hand leaving some nice chunks. Remove your broccoli, which should have softened but still be nice and crunchy, from the marinade and allow excess liquid to run off. Arrange the broccoli on a plate however it works best for you. What I have done is just one idea. Arrange the purple pasta and pesto on top of the broccoli. The sauce in the picture was created by blending 1/2c of cashews with 1c of the remaining beetroot marinade in a high speed blender. 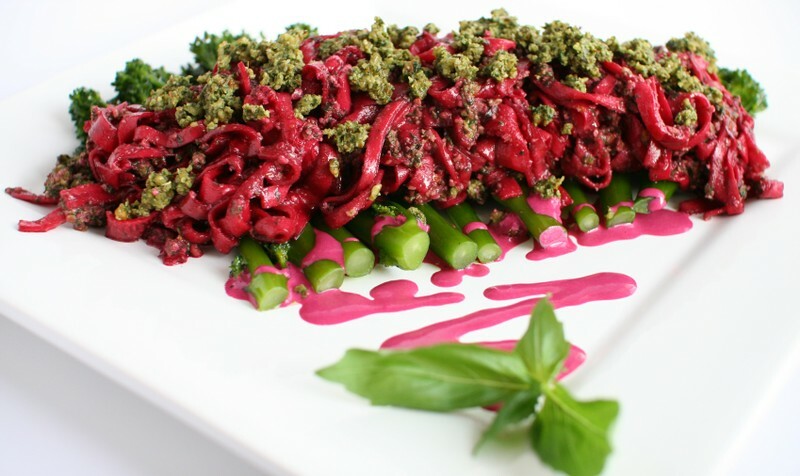 If you enjoyed this recipe you can see me demonstrate raw food recipes live at this years Fresh Festival in October. Click here for info and to book your ticket!